In a swift operation, cops attached to K.M. Doddi Police in Mandya district, yesterday, arrested 11 persons in Indavalu village for their alleged involvement in the murder bid on rowdy-sheeter Ashok Pai at his mother-in-law’s residence at Madarahalli in the wee hours of Tuesday and seized vehicles used for the crime and lethal weapons. 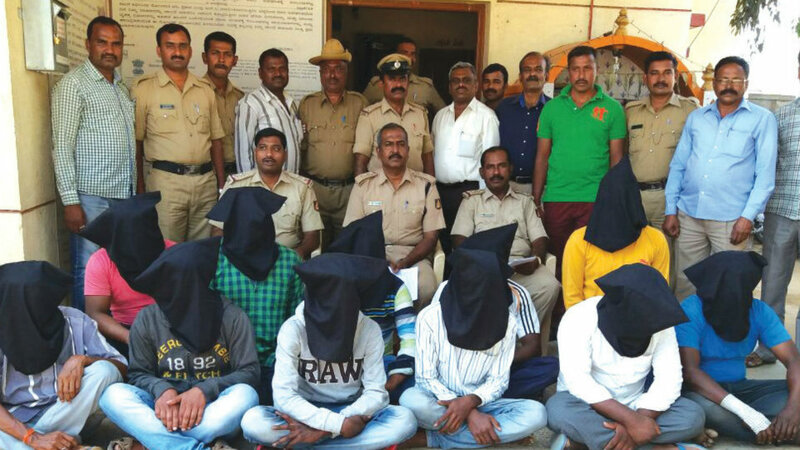 The nabbed have been identified as N. Raghavendra alias Guru of Mandya, N. Mohan Kumar, Nagaraju alias Naga of Bevukalla village, C. Chethan Kumar alias Kallahalli Chethan of Kallahalli, N. Manu of Mothahalli, C. Anil Gowda alias Ani of Hootagalli in Mysuru taluk, C. Nandeesh and H.A. Bhyrava alias Kumbi of Konanahalli, M. Somu of Srirangapatna, Ajjat Pasha alias Ajju of Mandya and Dhanu of Chennapatna. All the accused were produced before the Mandya Court in the afternoon and took Manu, Guru, Mohan and Chethan to Police custody for four days for further investigations while the others were remanded to judicial custody. It may be recalled that Ashok Pai, had managed to escape the kill bid after breaking the asbestos sheet of his mother in-law’s house and escaping through it when the gang attacked him when he was preparing to go to bed at about 3 am on Tuesday. Dy. SP Mathew Thomas supervised Circle Inspectors Santosh Kumar, SIs Ayyannagowda, Niranjan and Shivarudra and staff in the nabbing and seizing operation. It is said that the kill bid on Ashok Pai was plotted after he repeatedly refused to return the money paid to him by Raghavendra for converting into white money. It is said that Raghavendra, who had sold his house had reportedly given old currency notes to Ashok Pai to get them exchanged with new notes, hatched the plot to eliminate Ashok Pai along with his accomplices.